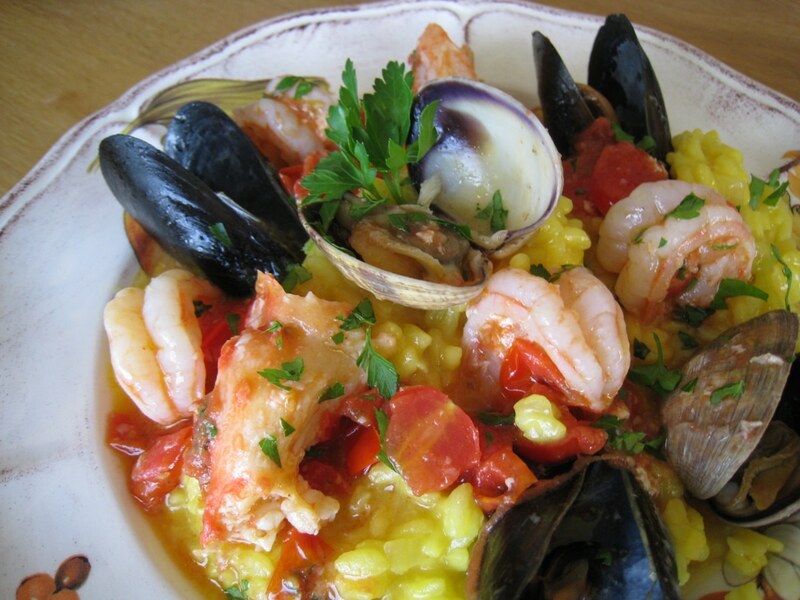 The best Italian Seafood Risotto Frutti di Mare recipe, made with shrimp, mussels, baby clams, crab, a good white wine, lots of garlic, tomatoes and an exquisite saffron seafood stock. Originally from Lombardy, the northern side of Italy, the Italian classic risotto has become a popular dish all around the world. 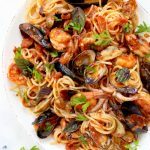 Healthy and gluten free, this otherwise known as Risotto alla Pescatora is what an authentic seafood risotto is all about! Tough you could make risotto with brown rice I would stick to the classic organic Carnaroli or arborio rice ( <—amazon affiliate) this time, because I want all the comforting creaminess possible. Risotto is an Italian first course ” primo ” of rice ( not pasta) cooked in some type of broth with butter and onion. The technique requires a little bit of stirring to help release the starches from the rice grains to obtain a smooth and creamy dish. Remember to taste as you go, the rice is cooked when al dente or “to the tooth” meaning with a little bite to it, not mushy. Don’t let the list of ingredients overwhelm you, risotto is actually so EASY to make! Also, remember to work with whatever seafood you’ve got in season! Can’t find any mussels ? No worries, double up on the clams or shrimp, add some squid tentacles in there or a few baby scallops at the last minute. Note worthy: I included the recipe for my homemade seafood stock below, but feel free to use a store bought vegetable stock and infuse it with some saffron when pressed for time. 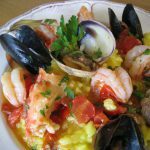 The best Italian Seafood Risotto Fruitti di Mare recipe, made with shrimp, mussels, baby clams, crab, a good white wine, lots of garlic, tomatoes and an exquisite saffron seafood stock. Start making the homemade seafood stock by combining all the stock ingredients in a large pot. Bring to a gentle simmer on low flame and cook for 1 hour. Remove the stock from the flame and strain through a fine mesh strainer. Stir in the saffron and allow to steep. In a heavy bottom sauce pan heat up 3 tablespoons of butter and 1 tablespoon of extra virgin olive oil. Add the minced onion or leek with a pinch of sea salt and sweat it on low heat for about 10 minutes until translucent. Stir in your risotto rice and allow it to toast for a few minutes until no longer opaque. Add the wine to the pan and stir until almost all is absorbed, but DO NOT let the rice dry out completely. Continue by adding the saffron infused stock a ladle at the time, waiting for the rice to absorb it before adding more. Make sure to maintain a constant ripple and NEVER ALLOW the RICE to DRY OUT. Continue cooking for about 20 minutes or until the rice grains are tender but have a little bite, Al Dente. Remove from the heat while it has the consistency of thick cream and stir in 1 tablespoon of butter for a silky finish . About 10 minutes before your risotto is done start cooking the seafood. Heat up a stainless steel skillet with 3 tablespoons of extra virgin olive oil over medium low flame. Pat dry the shrimp with paper towels and drizzle it with a lug of extra virgin olive oil. Season with a pinch of sea salt, red pepper flakes and black pepper. Mix together with the grated garlic then add it to the hot skillet. Toss it around a couple of times and only cook it for a minute or two until it curls up and turns pink. Transfer to a bowl and drizzle with a little freshly squeezed lemon juice. Add the tomatoes to the pan you cooked the shrimp in together with a pinch of sea salt. Hit it with the 1/4 cup of the white wine. Using a silicone spatula make sure to scrape up all the bits from the bottom of the pan. Cook for a couple of minutes until the tomatoes burst and start releasing their juices to form a nice sauce with the wine. Add the cooked shrimp with the juices back to the pan together with the crab meat and 3 tbs of the minced parsley. Gently toss to coat and drizzle with a little more lemon juice and olive oil. Adjust seasoning to taste and set aside. In a different skillet heat up the remaining 2 tbs of extra virgin olive oil over medium flame and add your clams and mussels. Hit it with a splash of stock or wine and cover with a lid. Cook until they open, about 3-5 minutes and discard all the unopened ones. 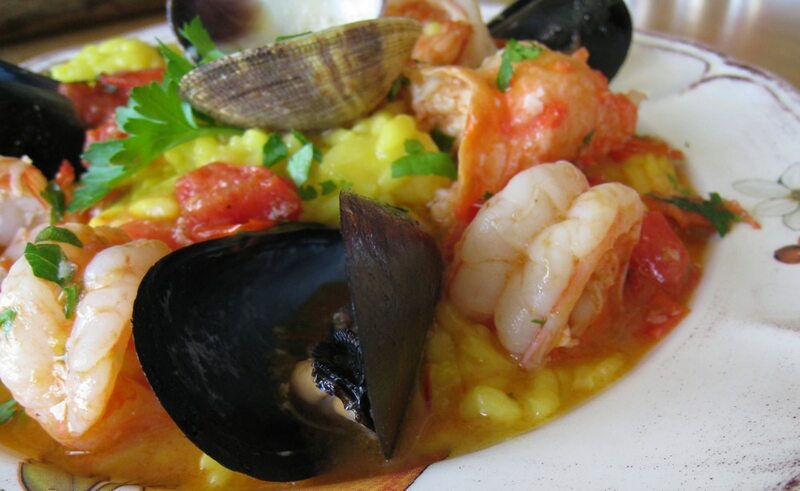 Divide your risotto between 4 plates and top each with 5 shrimps, 4 clams, 3 mussels and 2 pieces of the crab meat. Drizzle the entire plate with a spoon full of the tomato and wine sauce from the shrimp and crab. Serve the seafood risotto with a drizzle of extra virgin olive oil over the top and some chopped parsley. This looks absolutely wonderful- thanks for sharing. Can’t wait to try out the recipe! 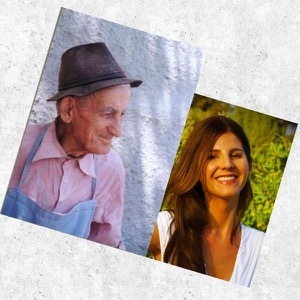 Thank you Miri, remember to share it with someone special, enjoy the life ! That was so incredibly tasty! 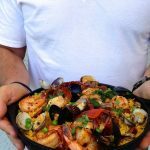 I really enjoyed all the different seafood flavors mixed in with the saffron and herbs paired up with the creamy texture of the rice – thank you for giving me the honor and pleasure of trying this recipe with you! Thank you for the company, i had such a lovely day and time ! This looks absolutely gorgeous. I really must try it. Thanks for sharing. My pleasure, and yes you must, it is a very special dish to share with someone special. Enjoy! This sounds yummy! Oh my goodness. Looks amazing!!! Does risotto travel well in a Fedex box?!? Already prepared risotto…. no. BUT making Risotto is easy, especially when you follow Florentina’s wonderful recipes. 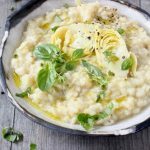 You can also get the “Ultimate Risotto Rice”, Acquerello, which Florentina mentions from http://www.Gourmet-Delights.com/store/italy.html With FREE shipping it is a no brainer. Give it a try! Creamy risotto is such a comfort food and so much fun to make with your girls. Everyone can take turns stirring , such a precious time. Enjoy Lana! 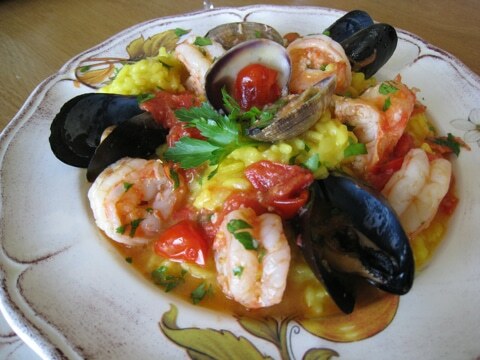 This recipe looks fantabulous and I LUV saffron, so I am very anxious to make this Shellfish Risotto in the coming week! Hi Dina, how have you been ? I missed you here ! Okay, this could top my favorite dish list. Risotto AND seafood. Yes please. I made a vegetarian risotto the other day with asparagus and peas. Thank goodness I had my boyfriend to do all the stirring, ha! Sharing the love. This looks incredible, very edible and certainly unforgettable..
Looks awesome! Great flavors ! Pinned! This risotto is out of this world. Takes a little while to make if you want everything from scratch but worth all the extra effort. I’ve never had risotto this good. recipe bookmarked! 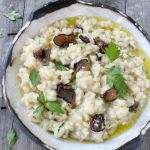 As an American transport living in Northern Italy, I’m exposed to some of the most amazing foods – seafood risotto being one of them. This recipe is outstanding! I made it tonight, paired with some Friulano wine and we were in heaven! Thank you for such thorough and easy to follow instructions. Hi! Making this for my moms birthday this weekend. I’m not using crab legs, so for the broth could I use the shell of the lobster instead? Or should I only use the shrimp shells?